Did the Prime Minister’s Dementia Challenge park a ‘National Care Service’ for good? I’m still unclear where and when the Prime Minister’s Dementia Challenge came about. I know that it was launched in March 2012. “Dementia” is not mentioned in the Conservative Party Manifesto for the general election of 2010. It is however mentioned in the Coalition Agreement, with broadly the same wording as the Liberal Democrat manifesto 2010, but that still doesn’t explain how this became the “Prime Minister’s Challenge”. But still no specific mention of that “Challenge”. The Dementia Challenge prioritises the Alzheimer’s Society, and it is clear that other charities, such as Dementia UK (which is experiencing threats of its own to its superb ‘Admiral nurses’ scheme) trying to plough on regardless. The £2.4 million “Dementia Friends” programme emerged from the Social Fund and the Department of Health. The scheme has been launched in England at first, and it is said that the Alzheimer’s Society is hoping to extend it to the rest of the UK soon. 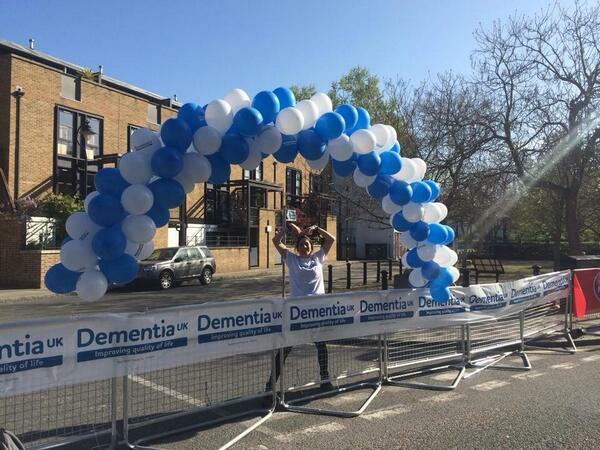 Indeed, many supported the fundraising for Dementia UK only this morning in the London Marathon too. There is no official cross-party consensus on the “Prime Minister’s Dementia Challenge”, though individual Labour MPs support the activities of “Dementia Friends”. The market dominance of the Alzheimer’s Society for ‘Dementia Friends’ compared to other charities does not seem to have been arrived at particularly democratically either. There is no conceivable reason why other big players, such as “Dementia UK” or the Joseph Rowntree Foundation, were excluded from this friendship initiative. Ironically, Japan upon which befriending is modelled is not ashamed of its care service. It is palpably unacceptable if people are ‘more aware of dementia’ without a concominant investment in specialist memory clinics, or care and support services. It is clear amongst my followers on Twitter that the nature of this “Challenge” is causing considerable unease. But there are now some very serious questions about this policy, particularly from the ‘zero sum gain’ effect it has had knock-on in other areas of dementia policy. When @Ermintrude2 looked into this at the time, the response was a bit confused. @mark_b33 @legalaware I think they are looking at the wrong problems. I was told by a DH official that agenda set by talking to..
And indeed Ermintrude has penned some thoughts at the time on this high impact blog. What has happened to social care in the name of ‘improvement’, I agree, is very alarming. @legalaware The Dementia Challenge – smoke and mirrors. Nice platform for government to make people think they are doing stuff.. But we do know full-well about the ‘democratic deficit’. The general public were unaware that a 493 Act of parliament called the ‘Health and Social Care Act’ would be sprung on them, with a £3 bn top-down reorganisation. But this was Lansley’s “emergency conference” on Labour’s “secret death tax” in February 2010. A number of views were expressed at the time, including the need for better care from the Alzheimer’s Society at the time under a different CEO. Where has the Society been in campaigning on swingeing cuts in social care? Also, in February 2010, Gordon Brown’s speech at the King’s Fund was reported, where Brown made a significant pledge. We do know that the NHS has been persevering with this programme with ‘efficiency savings’. In October 2012, it was reported that nearly £3bn was indeed returned to the Treasury, and it is unclear how, if it at all, it was returned to front line care. So it’s possible that Brown’s plan, the subject of a hate campaign at the time from the Tory press, might have worked in fact. 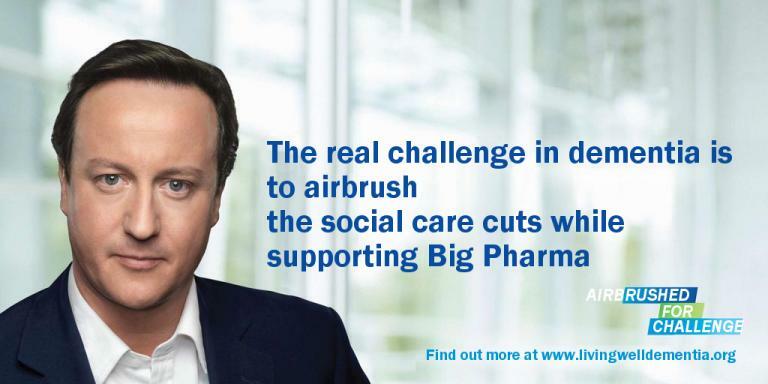 In 2010 Andrew Dilnot had been tasked by the then government to propose a solution to the crisis in social care. The response was from February 2013, after the top-down reorganisation. “Mr Dilnot suggested a cap on how much anyone would be required to pay for their care costs over the course of a lifetime, suggesting a ceiling of between £25,000 and £50,000 (in 2010/11 prices). Beyond this point, the state would take on responsibility for the majority of the bill. This issue may have to be revisited at some stage. Andy Burnham MP yesterday in the Bermondsey Village Hall, without much press present, mooted the idea of how a social care service could be established on the founding principles of the NHS, and would be a significant departure from the piecemeal 15-minute slot carers. Burnham stated that care provided by inexperienced staff on zero-hour contracts was a problem. An experienced member of the audience highlighted the phenomenal work done by unpaid family caregivers particularly for dementia. The topic of a compulsory state insurance is interesting. Insured persons pay a regular contribution to a health insurance fund based usually on income rather than reflecting their risk of illness. Clinical need and not ability to pay determine access to treatments and health care. Contributions to the social insurance fund are kept separate from other government mandated taxes and charges. In his classic article, Kenneth Arrow (1963) argues that, where markets fail, other institutions may arise to mitigate the resulting problems: ‘the failure of the market to insure against uncertainties has created many social institutions in which the usual assumptions of the market are to some extent contradicted’ (p. 967). A great advantage of ‘social insurance’ is, because membership is generally compulsory, it is possible (though not essential) to break the link between premium and individual risk. There might be other important aspects. For example, both employers and employees pay contributions. Also, there might be Government support for those who are unable to pay goes through the insurance fund. I have written before on the increasingly sophisticated methods of genetic diagnosis of dementias, and how this might impact on our health systems. The philosopher John Rawls (1972) argues that in a just society the rules are made by people who do not know where they will end up in that society, that is, behind what he called the “Veil of Ignorance”. Insurance can be interpreted as an example of solidarity behind the Veil of Ignorance: a person who joins a risk pool does not know in advance whether or not he will suffer a loss and hence have to make a claim. Insurance thus has moral appeal. Ultimately there is a problem as to what type of care might be covered. Does the policy cover only residential care, or also domiciliary care; is a person entitled to residential care on the basis of general infirmity or only if he or she has clearly-defined, specific ailments? In the Dilnot recommendations, the cap on care payments did not include the “hotel costs” that a care home will charge. In other words, people in residential care will still need to pay (at the Dilnot report’s estimate) between £7,000 and £10,000 per year to fund their accommodation and living expenses. Furthermore, how will the answers to these questions change with advances over the years with changes in the actual prevalence of dementia, or in the implementation of ever increasingly sophisticated medical technology? It has been proposed (Lloyd 2008) that long-term care could be financed via social insurance, with the premium paid as a lump sum either at age 65 or out of a person’s estate. The idea behind this proposal is twofol. Firstly, as a person gets older, the range of uncertainty about the probability of needing long-term care becomes smaller. Secondly, if a person can buy insurance for a single premium payable out of his or her estate, the cost of long-term care does not impinge on his or her living standard during working life or in retirement, but can frequently be taken from housing wealth. Development of social health insurance systems have normally been in response to concerns that inadequate resources were mobilised to support access to health services. Since there is no simple answer to the question of how much is the appropriate level of support, the issue of adequacy is best thought of as being a level that is considered appropriate in the country given its total resources, preferences and other development priorities. And where are people from charities campaigning on this issue? This issue of course was not considered at all in the G8 Dementia Summit, which focused on more monies for personalised medicine, genetic and molecular biology research, in response to concerns from an “ailing industry”. I am actually truly disgusted at this unholy mess. Arrow, Kenneth F. (1963), ‘Uncertainty and the Welfare Economics of Medical Care’, American Economic Review, 53: 941–73; repr. in Cooper and Culyer (1973: 13–48), Diamond and Rothschild (1978: 348–75), and Barr (2001b: Vol. I, 275-307).